A new study has been launched in Burkina Faso for Bharat Biotech's typhoid conjugate vaccine (TCV). It is the second clinical study underway in Africa for the vaccine and the first in West Africa. The vaccine study is a joint effort by the Center for Vaccine Development and Global Health (CVD) at the University of Maryland School of Medicine, (UMSOM) and Groupe de Recherche Action en Santé (GRAS) in Burkina Faso. Typhoid, a serious enteric fever caused by Salmonella Typhi, is spread through contaminated food and water. While largely eliminated in industrialized countries, typhoid continues to be a substantial public health issue that disproportionately impacts children and marginalized populations in much of Asia, sub-Saharan Africa, and parts of Latin America and the Middle East. The study is part of the Typhoid Vaccine Acceleration Consortium (TyVAC), an international consortium working to advance the introduction of TCVs in typhoid-endemic regions. This vaccine is considered to be the most effective in protecting against typhoid because it provides longer-lasting protection and can be administered to children under two years of age, allowing for inclusion in routine immunization programs. While this new typhoid vaccine has recently been recommended by the World Health Organization (WHO) there are no data on co-administration of the TCV with other routine vaccines. Researchers will study the efficacy in Burkinabe children and how their immune systems respond to the vaccine when given with other vaccines, such as yellow fever and meningitis A vaccines. "This is an important collaboration with our partners in Burkina Faso to test this vaccine in the West African setting," said Kathleen Neuzil, MD, MPH, UMSOM Professor of Medicine and Pediatrics and Director of the CVD and TyVAC Principal Investigator. "Millions of children are set to be better protected from typhoid fever through the broader global efforts to accelerate the use of the vaccine in conjunction with improving water, sanitation and hygiene." 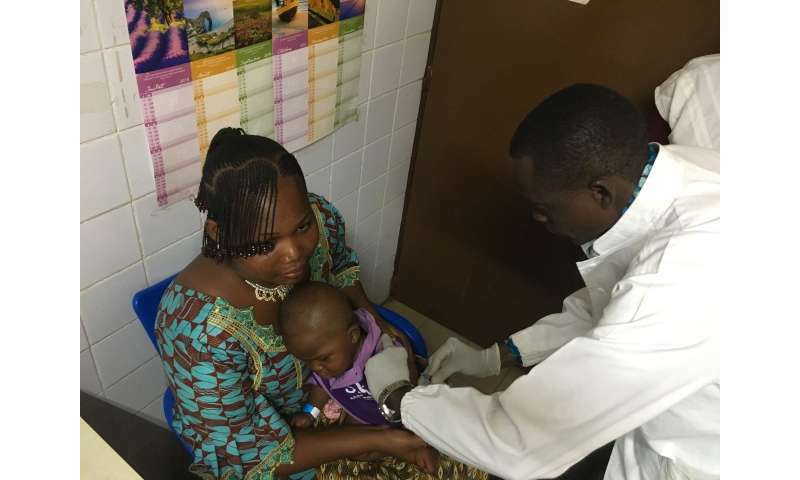 The Burkina Faso study comes after the WHO pre-qualified the vaccine in 2017 and as GAVI, the Vaccine Alliance, committed U.S. $85 million in funding to help introduce a TCV typhoid-endemic countries. "We are very enthusiastic about this opportunity to study the TCV and anticipate that the data from this study will inform decision-makers in the region highly affected by typhoid," said Sodiomon B Sirima, MD, Ph.D., the Scientific Director of GRAS and Co-Principal Investigator of the study onsite in Ouagadougou. The burden of typhoid is likely underestimated due to difficulties in surveillance and diagnostic challenges, but current estimates indicate that each year there are nearly 12 million cases and more than 128,000 deaths, with young children and adolescents aged 2 to 15 years disproportionately impacted. Though treatable with antibiotics, the rate of cases resistant to the available antibiotics is increasing. Vaccination and improvements in water, sanitation, and hygiene are key components of an integrated strategy to prevent typhoid.